What’s ahead for our region’s weather? In my August 1, blogpost, “Climate Change: Is It Real?” we noted that our climate is always changing. Some people want to debate the cause, but that’s not nearly as important as planning for the changes that are expected. A warming trend will amplify the extremes in our region’s climate, according to the Third National Climate Assessment. We can expect more intense summer heat waves, more droughts, and more floods. Annual average temperature in our region is expected to increase as much as 4.9 degrees Fahrenheit. Winter and spring precipitation is expected to increase 10-20 percent. We’ll see less snow and more rain. Storms are likely to be stronger, increasing the chance of flooding. Summer rainfall is expected to drop 8 percent, increasing the chance of droughts. Summer droughts can increase water demands on utilities for lawn irrigation. More frequent summer droughts can increase water demand for crop irrigation. The Miami Valley will need to cope with intense winter and spring rain events when human water demand is low. Likewise, we’ll need to cope with hotter – and sometimes drier – summers when human water demand is high. How can our region successfully cope with these challenges? Planning and wise infrastructure investment is the key. Here are some steps communities in our region can take to prepare for a warmer future. Minimize paved surfaces to reduce flash flooding and streambank erosion. 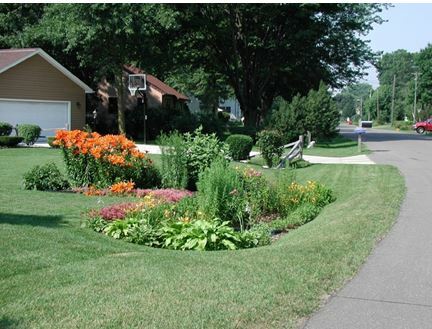 Encourage infiltration areas such as pervious pavement, rain gardens, and drainage swales to reduce urban runoff. Install flood warning systems in areas prone to flash flooding. Rain gardens reduce storm water runoff by using the rain water on your property, allowing it to soak into the ground and recharge the aquifer. Invest in more water storage to meet summer demands. Manage summer water demand through regulations, rate structures, or consumer incentives. Use the most efficient irrigation technologies to reduce summer water demand. Provide cooling shelters for people who do not have access to air conditioning during summer heat waves. Taking steps now is the key to preparing for a changing world. Our region is fortunate to have sufficient water resources and should be able to weather the forecasted changes if we manage those resources well. If we don’t prepare now, we’ll be playing catch up later, and that could prove to be costly. Groundwater levels in the aquifer beneath downtown Dayton fluctuate throughout the year. Locally, groundwater levels often peak in winter or spring and decline to their annual low in the fall. However, we’re seeing changes to the normal up-and-down cycle of groundwater in the aquifer in a couple of downtown wells. Groundwater levels fluctuate throughout the year. 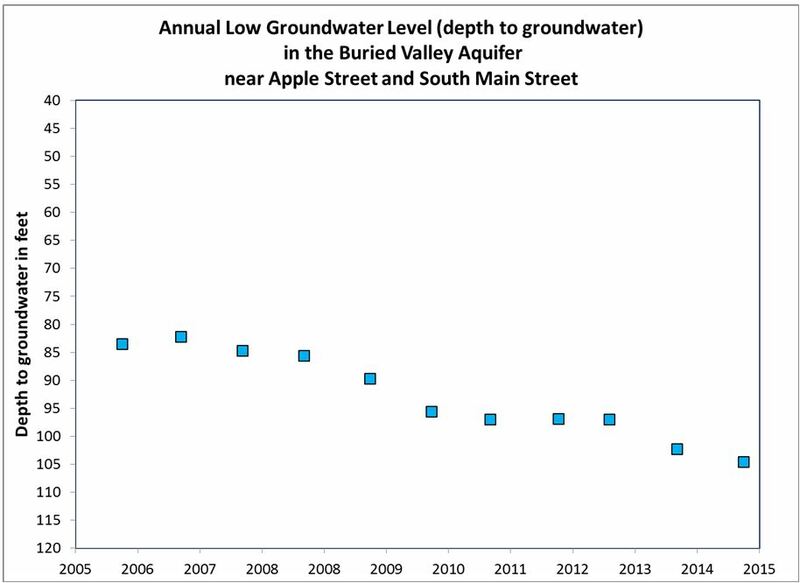 But the annual low groundwater level at the Apple Street and South Main Street observation well shows a decline over the past 25 years. The annual low groundwater levels in two downtown observation wells are showing a distinct downward trend, declining as much as 25 feet over the past 10 years. In fact, recent groundwater levels at both wells tend to be below monthly normals for much of the year. What’s causing the drop? An increase in geothermal heating and cooling systems in Dayton may be the cause. In the last 15 years or so, several buildings in downtown Dayton installed open loop geothermal systems. Open loop systems pull groundwater from high-capacity wells —tied to the aquifer beneath Dayton—to create heat and air conditioning. Is the aquifer going to go dry? Not likely. The buried valley aquifer, which stores this region’s groundwater, holds 1.5 trillion gallons of water. That said, in areas where a lot of groundwater is pulled from the aquifer, it’s possible for one well to cause another well to go dry. This situation is most likely to occur during summer months when water demand for cooling systems peak. MCD tracks groundwater levels at more than 100 monitoring wells in the region. The City of Dayton tracks groundwater levels at more than 300 monitoring wells throughout its well fields and within the aquifer. City officials say their well field areas are not impacted by the pumping of groundwater downtown. Can geothermal systems continue to be a workable option for Dayton buildings? Yes, provided there’s a plan to balance the number of systems and well locations. Inventory high-capacity geothermal wells in the downtown area. Fully understand current groundwater levels throughout the area. Assess the potential impact of new geothermal wells on existing wells and storm sewers. With these steps, Dayton—and other cities—can ensure existing geothermal systems will not be harmed by adding new systems, and all the systems will be sustainable.